The Certified Ostomy Care Nurse is a licensed Registered Nurse who has completed certification by the Wound, Ostomy, and Continence Nursing Certification Board (WOCNCB) and, additionally, successfully passed the exam enabling them to use the title of Certified Continence Care Nurse. Prepare with our COCN Study Guide and Practice Questions Print or eBook. Guaranteed to raise your score. The specialized certification provides the extra training necessary to adequately care for and treat patients who have an ostomy or ostomies along with the physical, psychological, and potential safety concerns associated with this. In order to be eligible to take the Certified Ostomy Care Nurse exam, the applicant must be a licensed Registered Nurse who has a Baccalaureate Degree. Initially, the RN must obtain WOCNCB certification. At least 1,500 hours of employment engaged in the care of ostomy patients must have been completed within the past 5 years, with 375 of those hours obtained during the past year. In addition, at least 50 continuing education hours in ostomy care should be completed in the past 5 years. The Certified Ostomy Care Nurse exam is offered quarterly at various testing centers across the United States. The fee to take the exam is $300 with discounts applied if more than one WOCNCB certification exam is taken at a time. COCN Flashcards. 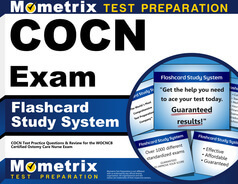 Proven COCN test flashcards raise your score on the COCN test. Guaranteed. The exam questions focus on testing the RN’s knowledge of care of the patient with at least one ostomy. These can address the physiological processes involved with elimination, along with the psychosocial and behavioral needs of the patient. The exam also contains questions pertaining to the devices used with an ostomy and educating the patient on self-care. Certification as a Certified Ostomy Care Nurse is valid for 5 years. At that time, the RN can retake the exam to recertify, or requirements for the Professional Growth Program are met to qualify for recertification. This program utilizes a mixture of direct patient care and continuing education activities to meet specific requirements necessary to maintain certification.